b) On top of the rocket is a bird, Ronald Story believes that if children could recognise the carving as being of a rocket, then the child would identify the hood ornament as a giant bird resembling a rooster, and that this bird was Quetzel, the national bird of Guatamala. Such a big would have caused problems aerodynamically if it were a part of the ship. For Ronald Story, the spacecraft is rather small with few outer protections for the rider, and there was the fact that the astronaut has his head protruding outside the rocket. The figure was barefoot and without gloves, with both fingernails and toenails seen, and has a complicated helmet that does not cover his face. 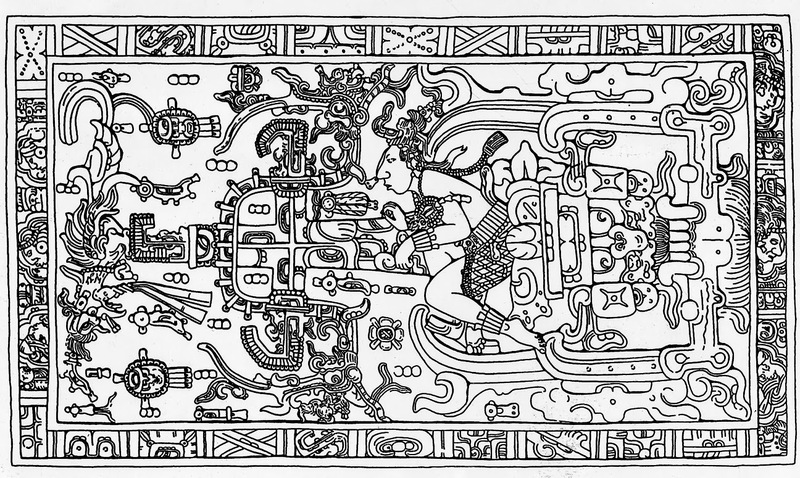 Except for a breachcloth and typical Mayan jade anklets, bracelet and necklace and 'helmet' on his head our astronaut is naked. In other words, he is a typically costumed upper-class Mayan of around A.D. 700 as pictured in other Mayan carvings and painting. d) Zechariah Sitchen talked about the enigma in his book The Lost Realms. But while he was able to see what was to be seen in the image, what Von Daniken was saying about it and how he was being ridiculed by Archeologists and other scholars, he could not claim to have a viewpoint about it. Ronald Story:"The personage in this Mayan stone carving from Palenque, Mexico has achieved an unexpected fame at the hands of von Däniken's description of the rocket-driving god Kukulkan is convincing in itself."